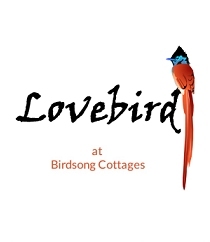 The brand new Lovebird unit is the latest edition to the Birdsong Cottages collection. The thatch-covered stone cottage, converted from a chapel built at the Uitkyk, is a romantic 1 bedroom unit with private bathroom, open plan living and dining area with kitchenette, deck and sparkling splash pool overlooking the valley below. With its perfect position overlooking the rich tree life of Birdsong Cottages, Lovebird is conveniently located on the upper level of the property close to the Flycatcher Villa and Sunbird cottages. It is also within walking distance of the Koi Pond venue and the reception. Parking is next to the reception. Access to the cottage is via a steep staircase and guests who book this unit need to note that the stairs may be problematic for guests who have problems climbing stairs or elderly and disabled guests. However, once at the front door of this gorgeous stone cottage, the entire unit is on one level, and the open plan living / dining area opens up onto a wooden deck with splash pool and breath-taking views. There is a cosy boma leading off from the deck via a short staircase. An evening beside a roaring fire in the bush can be quite romantic, especially since this unit only sleeps two guests. A comfortable bedroom with king sized four-poster bed is centred in the room with windows on either side, giving it a spacious atmosphere with plenty of light. The private bathroom leads off from the main bedroom and has a shower, toilet and basin. Please note that the unit does have a gas geyser. 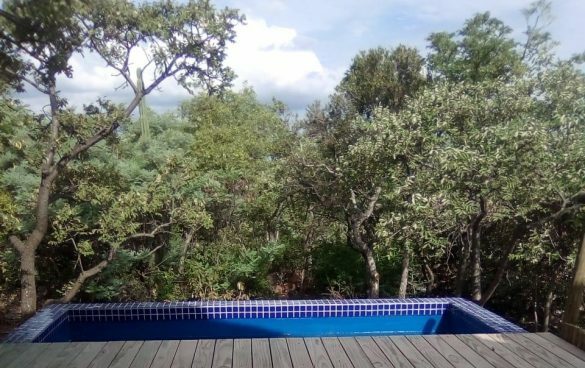 Located 14km outside of Modimolle on Birdsong Cottages, Farm Rietspruit, Driefontein, Section 29, Limpopo Province. From Pretoria: Follow the N1 towards Polokwane (Pietersburg), take the Modimolle (Nylstroom) off ramp at the Kranskop Tollgate. Turn left at the T-junction and follow the road towards Modimolle (Nylstroom). Turn right into Thabo Mbeki road (The Outdoor shop will be on your right) then travel for approximately 7km until you reach the DRIEFONTEIN turn off on your left. Travel on this gravel road for approximately three kilometres until you reach the Birdsong Cottages sign. Turn left and drive for another three kilometres to reach the entrance to Birdsong Cottages. From Polokwane: Follow the N1 south towards Pretoria; take the Modimolle (Nylstroom) off ramp (R101). Continue on this road for approximately 10km until you reach the DRIEFONTEIN turn off on your right. Travel on this gravel road for approximately three kilometres until you reach the Birdsong Cottages sign. Turn left and drive for another three kilometres to reach the entrance to Birdsong Cottages. 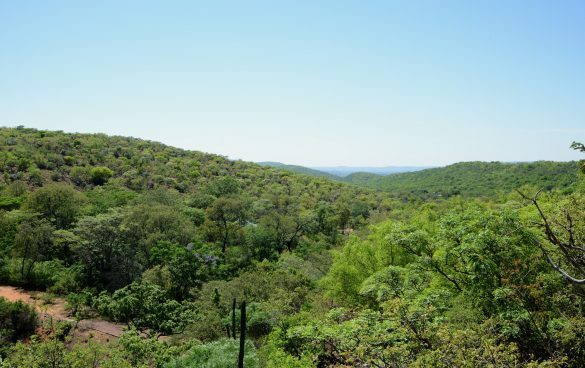 Guests at Birdsong Cottages can choose from a diverse range of activities in Modimolle, Bela Bela (formerly Warmbaths) and the surrounding areas of the Waterberg. Birdsong Cottages are situated 14 kilometres outside the lively town centre of Modimolle. The town offers various attractions including restaurants, tea gardens and shops. Visit historical Sites in Modimolle and Bela Bela. These include graves of Christina Pretorius (wife of Voortrekker Andries Pretorius), British Block House, Strydom House and the Concentration camp. Several Health and Beauty Spas in and around Modimolle and Bela Bela offer wonderfully indulgent pampering spa experiences. The Hydro (at Forever Resorts in Bela Bela) is famous for its therapeutic hot mineral springs, flowing out of the Earth at a rate of 22 000 litres of water per hour with a temperature of 52°C. Here guests can relax with specialised beauty treatments including full body massages, pedicures, manicures and hydrotherapy. Apart from the activities mentioned below, outdoor and adventure enthusiasts can also enjoy cable water skiing, quad biking, zip lining, clay target shooting, 4×4 trails, boating, hot air ballooning and archery. Walk or cycle in the Nylsvley Nature Reserve, situated in Africa’s largest inland floodplain. Open all year round during the day, this 4,000 hectare protected reserve offers a unique biodiversity of plant and animal life, including roan antelope, Tsessebe buck and approximately 370 bird species. During peak floods, the flood plain becomes a critical nesting and feeding site for over 80,000 migratory birds. Tee off for a game of golf at Koro Creek Golf Estate. Go mountain biking on 35km of farm roads at the 3,800ha Lindani game reserve, and then enjoy your own picnic in the reserve. Rated by Tread magazine as one of its top mountain bike single tracks, it is now open for day visitors. Booking is essential. Learn bass fishing from an expert in a nearby dam in Bela Bela. Enjoy the Waterberg on horseback as the first pioneers did many years ago. Savannah Horse Trails offers horse riding trails and safaris for experienced riders on trails that combine beautiful wilderness scenery and informative guiding. Get tactical. Skulls Paintball, situated on the R101 five kilometers from Bela Bela, offers a fun physical activity that demands teamwork and strategy planning. Boost your adrenaline by abseiling down a steep rocky mountainside at Mabalingwe Nature Reserve. Take a trail hike on a local game farm or enjoy an outdoor bush picnic. Take a game viewing drive at one of the local reserves and experience unspoilt Africa in an open vehicle through grasslands, rocky ravines and beautiful mountains. Pack a picnic and visit Doomdraai Dam Nature Reserve at the foot of the scenic Waterberg Mountains approximately 90 minutes drive away. Meet and interact with orphaned and injured wild animals at Sondela Wildlife Centre, open at specific times throughout the week. Pre-booking is essential. Experience an eco-drive, cultural tour and braai under African stars south of Bela Bela with Kwalata Culture and Wildlife Tours. They also offer various adventure teambuilding excursions. Take a walking tour at Bambelela Wildlife Care Farm. During these two-hour guided wildlife walks, you’ll learn more about indigenous vervet monkeys. Watch crocodiles feeding at the Thaba Kwena Crocodile Farm. Savour an unforgettable nature experience at the De Wildt Shingwedzi Cheetah & Wildlife Breeding Project. The centre offers two-hour tours where visitors get the opportunity to see and learn more about cheetah, wild dogs, caracal, serval, African wildcat and vultures. Have a thrilling hands-on interaction with elephants. The Adventures with Elephants educational facility is located on a beautiful 300-hectare wildlife reserve 35 kilometres from Bela Bela off the R516. The Hensman family runs the facility, having trained more than 60 elephants since 1988. Learn more about these gentle giants from their friendly experienced handlers as you greet, touch and feed them. You can also go on a Starlight elephant-back safari or even swim with these delightful creatures that enjoy interacting with humans. Take a walk on the wildlife side at the Dinokeng Game Reserve, which boasts abundant bird- and wildlife including zebra, giraffe, white rhino, warthog, black-backed jackal and the elusive African rock python. You can also see numerous buck species, including kudu, blue wildebeest, eland, waterbuck, impala, blesbuck, duiker, nyala and mountain reedbuck. View beautiful exotic birds, one of South Africa’s largest private primate collections as well as white lions, tigers and cheetahs at Mystic Monkeys and Feathers Wildlife Park near Rust de Winter. Visit the historical summit of Buyskop, situated approximately four kilometres north of Bela Bela. During the Republican days, the site provided fresh horses to travellers and acted as a halfway house for the mail coach that drove between Pretoria and Polokwane (formerly Pietersburg). Buyskop also contained deposits of sandstone that was used to construct some sections of the Union Buildings in Pretoria.